1.1 Where could I get this FAQ ? 1.6 Is there a Minolta mailing list ? 2.2 Many camera bodies today seem to be missing important features like depth-of-field preview or mirror lockup, which bodies offer these features? 2.10 Which manual focus camera are still made today? 2.10.1 Is there a difference between Japanese and Chinese versions? 2.11 Is there a 'professional' Minolta manual focus camera? 2.12 Can one use autofocus lenses (MAXXUM) on the manual focus bodies? 2.13 What were the Leica/Minolta collaborative projects? 3.1 There are different lenses series (MC, MD). What do they mean? 3.1.2 Can I use MC lenses on an XD- or X- series camera? 3.1.4 What are the codes on the older manual focus lenses? 3.7 Which lenses are still in production today? 3.8 Can one use manual focus lenses on the autofocus bodies (MAXXUM)? 3.9 Can one use autofocus (MAXXUM) lenses on the manual focus bodies ? 5.4 Cables - what are they all for? 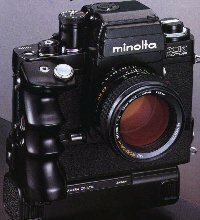 6.1 What other MF bodies did Minolta make?